Hand of Fate was a game that I was really taken with at PAX Prime 2014 and I was very happy to see it be a success upon its release the following year. I even interviewed the developers on The Sausage Factory podcast I was that taken with it. So when I saw its sequel Hand of Fate 2 arrive at PAX East 2017 I just had to take a look and see what else Defiant Development, the makers of both of the Hand of Fate games, had added to the concept of card game and action adventure. 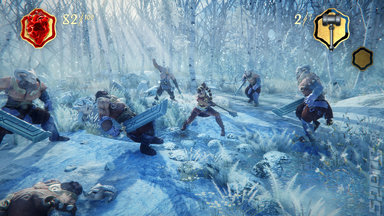 One of the criticisms laid onto the original title was that while the combat sections were fun, they lacked the frenetic nature and weight one would expect from such a melee based encounter. 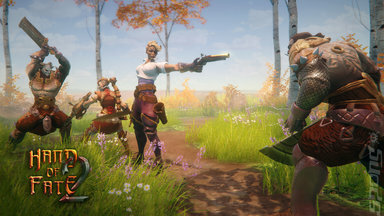 Hand of Fate 2 addresses these concerns by improving the combat significantly thanks to more responsive controls and a forgiving parrying system. There is also the addition of non-player character allies who help the player take on the foes alongside them. 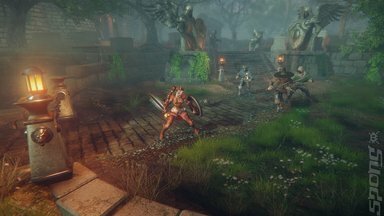 It's not only in the combat sections that Hand of Fate 2 differs from its predecessor. The card game that creates the adventures the player goes through has been altered with the addition of dice being rolled against The Dealer. So yes, The Dealer is back with his sardonic quips against the player as they progress through the adventure, much to his chagrin. Every success is met with derision and mocking, which only goes to encourage the player to plough on to spite the insufferable Dealer. As an added bonus, dice are rolled between the player and The Dealer and, provided the player beats him numerically, an extra boon can be granted. Another addition is an over-world map that has the player traverse through a mystical landscape as they go through missions to the eventual conclusion of saving the world, again. All of this despite the repeated protestations of The Dealer who so very clearly wants the player to fail. Finally, there is the game engine itself that does much to improve on the original thanks to a much more convincing and fluid combat arena as well as an even more animated card game environment. The voice actor Anthony Skordi reprises his role as The Dealer and does another great job in portraying the tortured soul of both facilitator and adversary. I had a great time playing Hand of Fate 2 at PAX East 2017 and I cannot wait for its arrival on Windows PC and PS4 later this year.